Is Your Home a Candidate for Skylights? 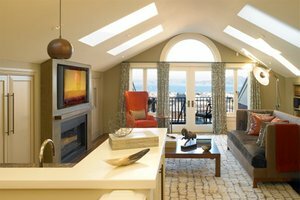 Skylights can be a fun way to bring some more light into your living space. However, they can cost big bucks to install. Is your roof framed with trusses? Truss framing is typically 24-inch on-center, which accommodates a 2-foot-wide skylight (they’re actually 22.5 inches wide). However, if you need to cut into a truss for a wider skylight (they can range up to 4 feet wide and 6 feet long), you’ll have to hire a structural engineer to spec alternative framing. Costs for engineering run from $300 to $500. Is the attic space clear? Once you have an idea where you’d like to add a skylight, check the attic for any HVAC, wiring, or plumbing in the way. Will you need a chase? A chase is a framed tunnel that channels light from the skylight through your attic space to the ceiling below. Typically it’s finished with drywall and painted. Because it’s complex to build, it adds about $1,500 to a professional installation. Note: If you have a cathedral ceiling, you won’t need a chase. Will a skylight suit the architectural style of your home? In many ways, a skylight is a neutral element that blends with most styles, but it may affect the curb appeal of an older home. Can a solar light tube do the job as well? At less than 20% of the installed cost of a skylight, a solar light tube can illuminate an area of 200 to 600 sq. ft.
Cut a hole in the roof and alter the rafter framing: About $500. Install and flash the skylight: With asphalt shingles, expect this stage to cost about $500 — figure 20% to 30% more for metal or tile roofing. Build a chase from the skylight to the interior ceiling: Estimate $1,000 to $1,500. Repaint the entire ceiling beneath the skylight: Plan a minimum of $250 if you hire a pro. If you have an open-plan home, budget for more. A venting skylight that opens manually using a hand crank runs $300 to $600. An electronically controlled venting skylight that opens and closes with a remote control costs $600 to $1,000; including a rain sensor that automatically closes the skylight adds $200 to $300. Built-in mini blinds let you fine tune the amount of light. They operate by means of a stick crank or remote control. Blinds cost $200 to $400. Exterior Specialties of PA is here to help with all of you window installation, window maintenance and window repair needs. Call us today at (215) 773-9181 for your FREE estimate!